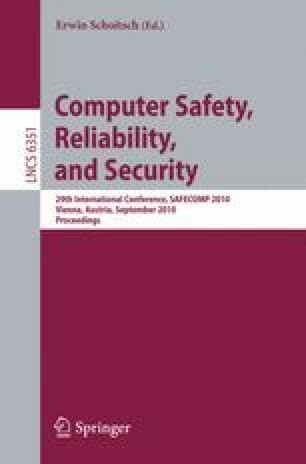 In this paper we describe a novel concept for reliability analysis of communication architectures in safety-critical systems. This concept has been motivated by applications in the railway control systems domain, where transitions into stable safe state are usually considered as undesired events because they cause a severe deterioration of the service reliability expected by end users. We introduce a domain-specific language for modelling communication architectures, the protocols involved and the fault hypotheses about anticipated deviations of communication channels and possibly other components from expected behaviour. From such model, a generator creates mutant models associated with probability formulae expressing each mutant’s probability of occurrence. Each mutant is analysed with respect to its unreliability, that is, whether it contains paths leading into stable safe state. Then the system reliability can be conservatively estimated by calculating an upper bound of the probability for the system to perform a transition into stable safe state within a given operational period. Our approach deliberately refrains from utilising probabilistic model checking, in order to avoid the state space explosions typically occurring when considering all possible erroneous behaviours within a single model. Instead, we analyse many different models, each only containing a restricted variant of deviations, which leads to faster evaluation times. In addition, several models can be evaluated in parallel in a distributed multi-core environment.